The Great Barrier Reef is undisputed as one of the world’s most important natural assets. 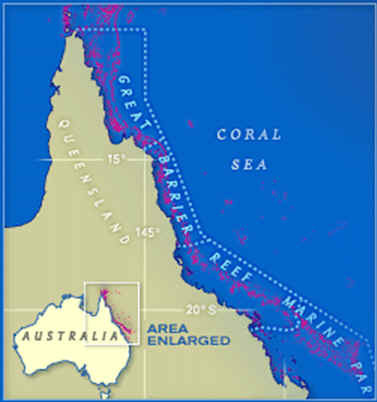 Geographical LocationThe reef is located in the Coral Sea, off the coast of Queensland in northeast Australiafrom just south of the Tropic of Capricorn to the coastal waters of Papua New Guinea 24°30'N-10°41'S, 145°00'-154°00'E. Wildlife There are over 1,500 species of fish, 400 species of coral, 4,000 species of mollusc and 242 species of bird within the park, plus a great diversity of sponges, anemones, marine worms and crustaceans. The site includes major feeding grounds for dugongDugong dugon. Several cetaceans are present, including humpback whale Megaptera novaengliae , minke whale Balaenoptera acutorostrata and killer whale Orcinus orca. Dolphins include bottle nose Tursiops truncatus, Irrawaddy Orcaella brevirotris and Indo-Pacific humpback Sousa chinensis. Offshore, spinner dolphin Stennella longirostris is also occasionally seen. There are nesting grounds of world significance for green turtle Chelonia mydas and loggerhead Caretta caretta , and habitat for four other species of marine turtle. Bigger than the entire area of Italy, it is probably the best known marine protected area in the world. The Great Barrier Reef's great diversity reflects the maturity of the ecosystem, which has evolved over hundreds of thousands of years. It is the world's most extensive coral reef system and is one of the world's richest areas in terms of faunal diversity. 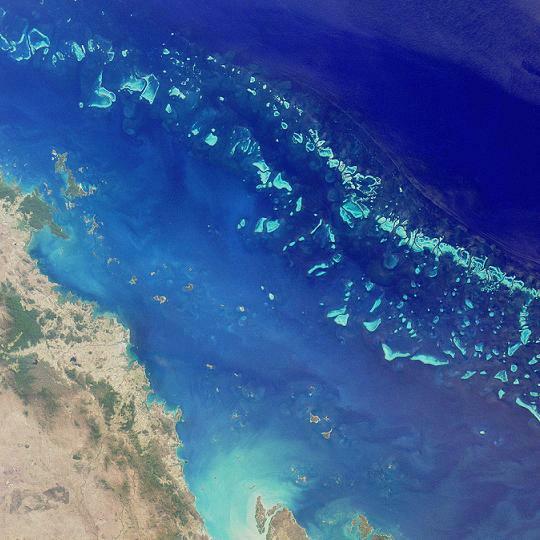 NASA Earth Observatory-In late February 2007, NASA satellite images revealed that even the outer portions of the Australia’s Great Barrier Reef can be bathed in land-based pollution carried far offshore by plumes of river water. Conventional thinking was that river plumes affected only the lagoon and the inner portions of the reef. But images from the Moderate Resolution Imaging Spectroradiometer (MODIS) on NASA’s Terra satellite verify a new theory that not even the outer reefs are spared the impact of land-based pollution, which includes excess sediment, fertilizers, and pesticides. This image from February 9, 2007, shows plumes of sediment flowing into Princess Charlotte Bay, which is about halfway down the east coast of Queensland’s Cape York Peninsula. After heavy rains fell in late January and early February, several rivers were emptying muddy water into the bay. The plumes merge into a 12-kilometer-wide river of sediment-laden water (flanked by white arrows) that heads almost due north and washes over a large coral reef. The sediment makes the normally turquoise-colored reef look greenish-brown. The plume veers northeastward away from the first reef, and although the plume becomes fainter, it does reach the outer reef. Similar plumes are visible along much of the coastline (visible in the large version of the image). 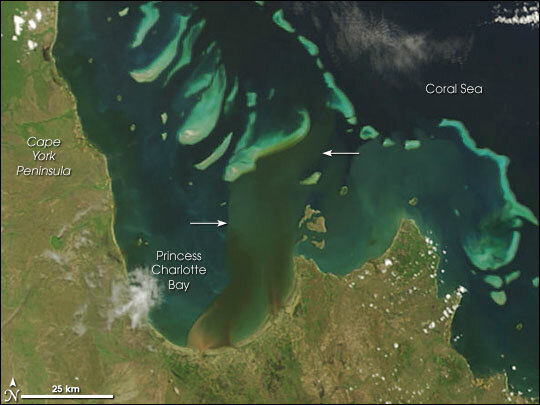 According to the scientists at Australia’s Commonwealth Scientific and Industrial Research Organisation who first publicized them, the images provide proof that scientists monitoring and trying to safeguard the health of Australia’s Great Barrier Reef must begin to consider the effect of extreme coastal flooding events that can spread pollution much farther than they previously thought. Carbon dioxide is increasing the acidity of the oceans. Ocean acidity is increasing at a much faster pace according to marine scientists meeting in Australia's capital, Canberra, at the Coral Reef Futures 07 Forum, October 18-19, 2007. "It appears this acidification is now taking place over decades, rather than centuries as originally predicted. It is happening even faster in the cooler waters of the Southern Ocean than in the tropics. It is starting to look like a very serious issue." 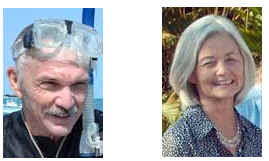 said Professor Malcolm McCulloch of the Centre of Excellence for Coral Reef Studies (CoECRS) and the Australian National University. Over time, the acidic water dissolves the shells of coral and marine life. The Barrier Reef is losing one to two percent of coral each year and all of the reef’s coral could be gone in 40 years. The environmental problem is not just restricted to Australia, almost half of the world’s reefs are under threat, with 44 percent of the world’s reefs already severely degraded. NASA Earth Observatory-Summer officially came to an end in Australia on March 20, 2006. For northeastern Australia (Queensland and New South Wales), it was the hottest summer on record, according to the Australian Bureau of Meteorology, and that was bad news for Australia’s Great Barrier Reef. Up to 50 percent of coral bleached at certain inshore locations in the southern Great Barrier Reef. In general, hot water puts coral under stress. Under such conditions, the coral expels the tiny algae, zooxanthellae, that live in symbiosis with it. The algae give the coral its color and produce nutrients through photosynthesis, so when the algae are expelled, the coral turns white and eventually dies. The process is called coral bleaching. But coral bleaching is only one symptom of an ecosystem in hot water: high temperatures have a negative impact on other parts of the marine ecosystem as well. “All marine species operate within a range of environmental parameters. Once this changes, the effects cascade through the food-chain,” says Scarla Weeks, an ocean researcher at the University of Queensland, Australia, funded by the Pew Institute for Ocean Science. Ocean currents are driven in part by water temperature, and if a current shifts, this may impact an entire ecosystem. Warmer temperatures may result in decreased concentrations of phytoplankton, the tiny plants that grow in the upper sun-lit layer of the ocean. Because phytoplankton form the base of the marine food chain, their decline will cascade through the food chain. Larger animals like fish will have little to eat and either die or move elsewhere. Loss of fish impacts the sea birds that feed on them. In 2002, says Weeks, high sea surface temperatures led to the worst bleaching event on record in the Great Barrier Reef. The same year, 50 percent of seabird chicks on Heron Island in the southern Great Barrier Reef starved because the adult birds were unable to find enough fish. The chain from warm water to coral bleaching and sea bird deaths is long and complex, but satellite data may provide some insight into the mechanisms controlling the chain. Weeks is using NASA sea surface temperature and chlorophyll concentration data to study these complex ocean processes. 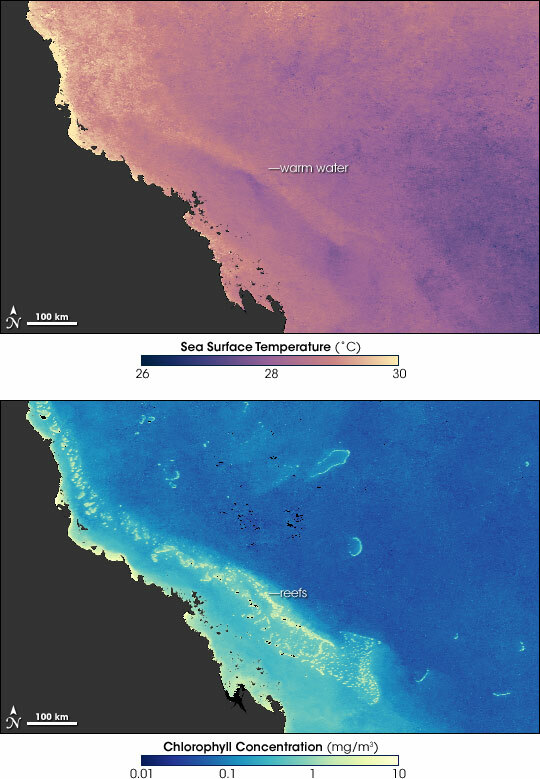 The images above illustrate sea surface temperatures and chlorophyll concentrations as observed by the Moderate Resolution Imaging Spectroradiometer (MODIS) on NASA’s Aqua satellite between February 6 and February 20, 2006. Warm pink and yellow tones show where sea surface temperatures were warm in the top image. The warmest waters are the shallow waters over the reef near the coast, where coral bleaching was most severe this summer. The lower image shows chlorophyll concentrations, where high concentrations (yellow) generally point to a high concentration of phytoplankton in surface waters of the ocean. In this image, the bright yellow dots actually represent the coral reefs, and not surface phytoplankton. Ocean waters are clear off Australia’s northeast coast. The patterns shown here reveal the movement of ocean currents, with lower chlorophyll concentrations representing oceanic waters. By studying the changing patterns, scientists can monitor the dynamics of the Great Barrier Reef and every link in that marine ecosystem.